The Assembly recognizes that there the definitions and dimensions of wellbeing/wellness are not universally fixed and that individual campuses may embrace and use one term or model over the other. We hope that this overview of key concepts helps individuals entering these conversations with additional context and a shared language related to health and wellbeing. In the Ottawa Charter for Health Promotion, the World Health Organization (1986) defines health as complete physical, social, and mental well-being. This signaled a turning point in how health and wellness was understood internationally, with a shift away from treating illness and a move towards wellbeing. Health encompasses where we work, live, play, and socialize, and it is necessary to promote health in all aspects of our lives instead of treating illness. This focus on health promotion, as outlined by the Ottawa Charter, recommends five areas for action, including “building healthy public policy, create supportive environments for health, strengthen community action for health, develop personal skills, and reorient health services.” (World Health Organization, 1986). What’s the difference between these two terms and does making a distinction between them really matter? As this domain continues to evolve, so do the words we use to describe and mobilize the multi-layered conversation involving health and wellness, or wellbeing. Many people use these terms interchangeably, but as the landscape changes, many are now asking is it “wellness,” or “wellbeing,” and does it really matter? Susie Ellis, The Global Wellness Institute’s Chairman, predicts perceptions are changing as wellness is becoming more associated with health and prevention while wellbeing is associated with happiness (Global Wellness Institute). In this shift in paradigm, wellbeing refers to a more holistic approach to health by including the presence of positive emotions and moods, the absence of negative emotions, and satisfaction with life, fulfillment and positive functioning (WebMD Health Services). More simply, wellbeing can be referenced as a holistic “whole-of-life” experience consisting of judging life positively and feeling good (Centers for Disease Control and Prevention, Health Related Quality of Life [HRQOL]) while wellness refers to the active process through which people become aware of, and make choices toward, a more successful existence. (National Wellness Institute). Centers for Disease Control and Prevention – “Well-Being Concepts” | Updated May 31,, 2016. WebMD Health Services – “Wellness vs Well-Being: Is Your Program Designed for Everyone?” by Christine Muldoon | May 18, 2015. On college campuses there are often discussions concerning achievement gaps, and initiatives are produced to reduce these gaps. (Articles – Expert: Achievement Gap a National Crisis; Students Affected by Achievement Gaps). However, there also needs to be consideration of a wellness gap that likely exists among students on college campuses. Education, socioeconomic status, and access to programs influence one’s health and wellbeing. Questions to ask and attempt to answer include: Is there a wellness gap on campus? If so, how can the gap be reduced? What are barriers for students when it comes to their health and wellbeing? What are pathways to wellness for students? NASPA Student Affairs Administrators in Higher Education offers a Wellness and Health Promotion Knowledge Community that provides opportunities for student affairs professionals, campus administrators, faculty members, and students to explore and address the complex relationships between health and learning. Their glossary of terms defines additional topics pertinent to wellness, wellbeing, and health promotion discussions. Don’t see a concept you were hoping to learn more about here? 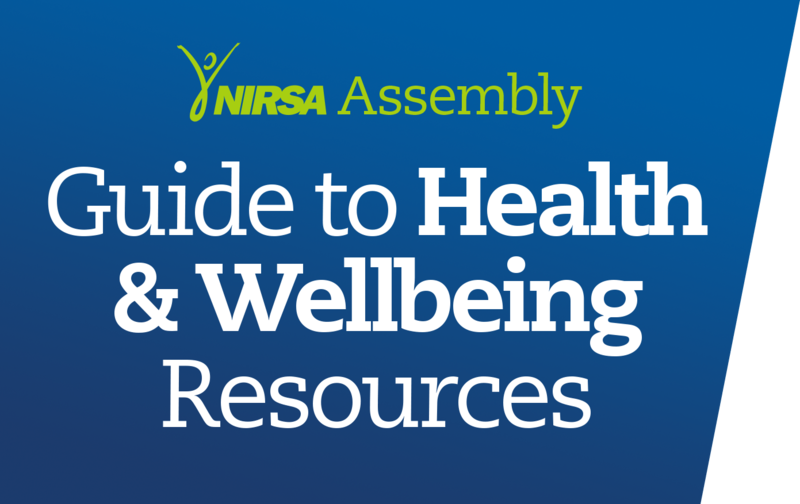 This guide was developed by the NIRSA Assembly.